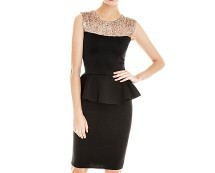 This stylish black peplum dress is a super hot choice right now! Peplum dresses are extremely figure flattering for all, and this design also features the striking stud detail trend that is seen everywhere this season! Great for parties or nights out, this is great dress for all women! This design features a bodycon fit for smooth results, the peplum frill situated around the waist will help to accentuate curves, whilst conceal tummies for a more flattering result, and the stud detail situated around the neck area and the shoulders is what makes this dress really stand out from all the rest! All that is needed to complete a great look is a fabulous pair of heels and a clutch, and you are good to go! Extend the rock chic vibe with a studded faux leather jacket and opaque tights for chillier nights, otherwise dare to bare those legs and look hot for summer!